Negotiations to resolve Honduras’ political crisis failed Sunday after representatives of its interim government and ousted President Jose Manuel Zelaya were unable to reach a consensus. The interim Honduran government of Roberto Micheletti on Sunday rejected a proposal advanced by a mediator to resolve the crisis by reinstating Zelaya. “I’m very sorry, but the proposal you presented [is] unacceptable by the government of Honduras that I represent,” Carlos Lopez, who was representing Micheletti at weekend negotiations, said of the proposal advanced by the mediator, Costa Rican President Oscar Arias. 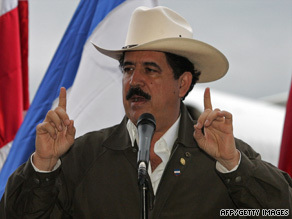 Zelaya’s representatives said this marked the end of talks with Honduras’ interim government. Zelaya had accepted the proposal presented by Arias, who was hosting the negotiations at his home in Costa Rica. The proposal, presented by Arias to both sides on Saturday, would have returned Zelaya to the Honduran presidency. It would also have compelled Zelaya to abandon efforts to modify the country’s presidential term limits. Zelaya was removed from office June 28 in a military-led coup that has drawn international condemnation. Congressional leader Micheletti was sworn in hours later as provisional president. Micheletti and his supporters, including the Honduran supreme court, congress and the military, argue that the action was not a coup, but a constitutional transfer of power. Other steps proposed by Arias included moving up elections scheduled for late November, establishing a national unity government, providing amnesty for all political crimes and setting up an international commission to oversee implementation of the accord. Under Arias’ proposal, oversight of the Honduran military would have switched from the executive branch of government to the Supreme Electoral Tribunal one month before the elections. Delegations representing Zelaya and Micheletti also met at Arias’ home in Costa Rica last week but did not reach an accord. Zelaya, a leftist who took office in 2006 on a narrow victory, had been at odds with Honduran lawmakers, the country’s supreme court and the military over his attempts for a referendum on whether to establish a constitutional assembly. He sought the referendum, which he planned to hold last month, to see if voters wanted a measure on November’s ballot to establish a constitutional assembly to study whether a president could run for re-election. Under the current charter, a president can serve only one four-year term. Congress had forbidden the referendum and the supreme court ruled it illegal. The military declined to participate in its usual role of safeguarding the vote, saying it could not take part in an illegal act. Zelaya vowed to hold the vote anyway, but was toppled before the voting started.